awesome how such a multilateral community about my main character can exist! 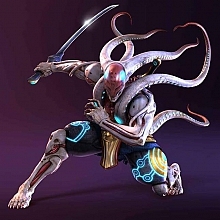 yoshimitsu because he looked like a cool robot and was the only charakter with a weapon. i lost. and i sweared to god, i never would loose again so badly in this game. itself. i was like "can´t be, i can´t be the world best tekken player!" a few weeks later i´ve had my first DR offline session and got raped like i´ve never stoped playing my uncle. beginner like me i was even more ambitious to play that char like the devil himself. have my own internet or to beeing not clever enough to use it. Welcome Zen.. Its nice to hear about your uncle and all ( cos my nephew will also think similar ) :p. Lei is also cool character like Yoshi... This sites gone quite dormant since its xmas season or something. Enjoy your stay. if there isn´t anymore contact until next year: merry xmas and a happy new year to everyone! why, have i ever done bad things? Great to have you here Zen. You seem passionate and knowledgeable which makes you a perfect clan member. I have the passion but besides that, I am more just a part of the furnature here (^.^). Welcome to YOT!! yoshi player to understand this char a bit better. at the moment it´s like we´ve never existed and that´s really sad.